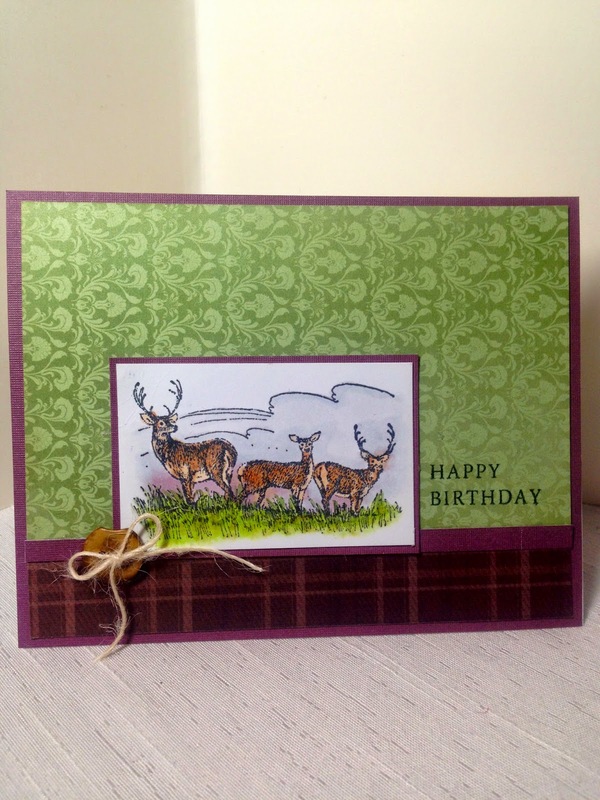 I have a simple, masculine card to show you today that would be perfect for the hunter or wildlife enthusiast in your life. Because I made this card for a guy, I kept the sketch very clean and simple. I used fall paper from DCWV "The Pumpkin Patch" matstack. My image is from retired Stampin Up! "Noble Deer". This stamp set gets a lot of use from me as I know so many deer hunters where I live. The sentiment, believe it or not, is from PTI 'Mothers'. The font just worked perfectly for my card since it's so plain and simple. As much as I love this set for guy cards, I have always found the images very difficult to color. I water colored this image using water color pencils. I think pencils or watercolors work best with the images in this set. A simple chipped wooden button and twine was the only embellishment I added. A wonderful masculine card. I agree, the sentiment works so well with the image! Great papers too and love how you colored the image. Wow, Amy! Beautiful card! Love the deer! Looks like our countryside :-) Hugs! This is a perfect masculine card, I really like it! Wow, gorgeous masculine card - love everything about it. Love the papers too - they match the image so well.